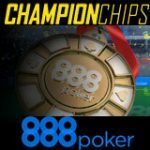 The schedule for the 888poker Summer ChampionChips tournaments has been released with eighteen events and a total of $150,000 in prize pools. 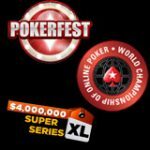 Earlier this week we posted about the qualifiers for the Main Event of the Summer ChampionChips Series and how to win a seat for only 30¢. The series of low buy-in tournaments have direct buy-ins ranging from $1-$55, players can also qualify for the events by playing step tournaments starting from 1¢. 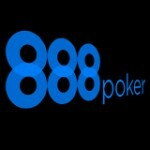 Signup and get up to $88 free at the World's 2nd largest poker site 888poker, double your first deposit up to $400. 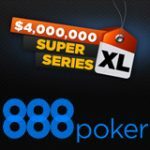 The 888poker Summer ChampionChips series is scheduled to take place between 14-21 August, 2016 with 18 events with micro-low stakes buy-ins. There is a more than $150,000 in combine guaranteed prize pools to be won throughout the series with a variety of events to choose from. The series also features a leaderboard which payout the top 200 positions with a $1,000 for first place as the most consistent player of the series. 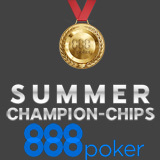 download 888poker - play for your ticket to the qualifiers for free by playing the Summer ChampionChips free tournaments which run from 6-18 August, register for free, no tournament ticket required. There will also be selection of Summer ChampionChips Step tournaments starting from just 1¢, play your way through the steps to get to the final tournament.